The Billboard of March 26th 1949 first teased Young Love as a Summer program. The Billboard teases the start date of Young Love in its June 4th 1949 issue. Education at all levels had become a national priority during World War II and even more important to the Nation's recovery in the wake of a second world war during only 30 years. Both CBS and NBC, the two giant networks of the era, had embarked on a long-running era of educational programming; in several instances conferring College Equivalency credits from participating schools and colleges. 'College by Air,' though a highly laudable undertaking for its time, soon became eclipsed by the hundreds of thousands of G.I.s returning to high schools, colleges, trade schools and universities across the Nation under the aegis of the 1944 G.I. Bill of Rights and its generous educational subsidies and stipends. From both NBC and CBS' perspectives, the time seemed right to mount popular programming anchored around higher education. CBS first teased their Our Miss Brooks concept to the trade papers in a January 10th 1948 press release. Our Miss Brooks quickly became one of the network's most successful productions. NBC, in no small part due to the accelerating success of CBS' Our Miss Brooks, mounted its own college-based situation comedy, The Halls of Ivy in June of 1949. The Halls of Ivy was a comparatively unexpected entry into the NBC lineup of the post-World War II years of Radio. What seems even more unexpected was why no one at NBC had evisioned such a production on the heels of World War II. Our Miss Brooks, arguably the high school precursor to The Halls of Ivy, had already been airing for well over a year prior to The Halls of Ivy. Any comparisons--or contrasts--between the two education-themed productions are admittedly slight, but they do bear a brief acknowledgment. More slapstick, by comparison, Our Miss Brooks did, indeed, re-introduce America to formal education in the post-War years. 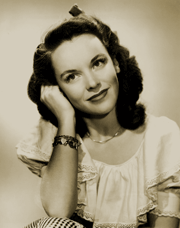 Their only two uniting performers--Gale Gordon and Jane Morgan--leant the same flavor to both productions [both Our Miss Brooks and The Halls of Ivy] in their respective performances, although Jane Morgan in a somewhat smaller capacity. Don Quinn and his staff included some of the finest writers in Radio history, including Lawrence and Lee, Barbara and Milton Merlin, Walter B. Newman, and Hector Chevigny. Musical Theme(s): "I Love You Truly"
The Billboard reviewed the premiere of Young Love in its July 23rd 1949 issue. 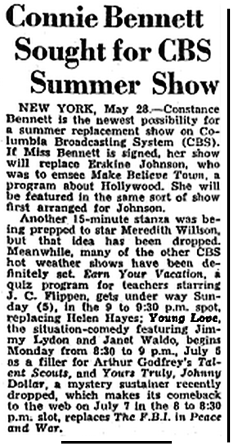 "Young Love," starring Janet Waldo and Jimmy Lydon, will be the summer replacement for Arthur Godfrey's "Talent Scouts" on CBS Starting July 4. 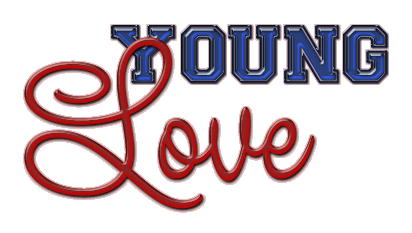 6:30 p.m.--Young Love (WBBM): new series with Janet Waldo and Jimmy Lydon. 8:30-KNX-A brand new comedy series about the problem of a married student couple at college gets under way tonight over KNX. Starring Janet Waldo and Jimmy Lydon. 6:30 p.m.--Young Love (WBBM): Janet and Jimmy celebrate their "weekiversary." 8:30-KNX-Jimmy and Janet the principals of "Young Love," have read a book . . . "Perfect Marriage" . . . It recommends a honeymoon . . . and how they manage it, with one day and no money to spare, is described on tonight's episode. WBBM 8:00 Leave It To Joan; 9:00 Community Chest. 7:00-KFI-KECA-KNX--Speeches by President Truman and Henry Ford II and a gala variety program will open the Red Feather campaign for the Community Chests of America. 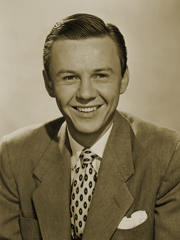 7:00--KNX--There is trouble ahead for Jimmy on "Young Love" . . . he finds out in advance what Janet will wear to the Halloween Masquerade ball . . . but she has a double. 9:30-WCBS--Documentary Drama: The Rising Wonder, with Mark Stevens, Narrator, Antonini Orchestra. THERE'S FUN FOR EVERYONE IN "YOUNG LOVE," a new Friday comedy series about a young couple at college who try to keep their marriage a secret. "Young Love" stars Janet Waldo and Jimmy Lydon. KTSA--8:30 p.m.
50-03-04 San Antonio Express - Young Love, KTSA, 6 p.m., wherein Jimmy tries to star in basketball and winds up as water boy on the fifth team. 50-03-11 San Antonio Express - Young Love, KTSA, 6 p.m., in which Jimmy locates the perfect honeymoon cottage to use for one week. 50-04-08 San Antonio Express - Young Love, KTSKA, 6 p.m., wherein the addlepated Miss Darling is appointed instructor of a marital-relations course.